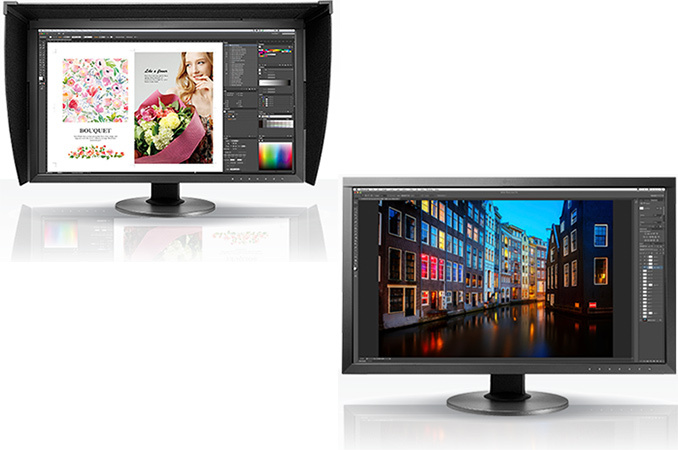 EIZO has introduced two new 27” displays designed for professionals and prosumers. The ColorEdge CG2730 and the ColorEdge CS2730 monitors share a lot of technologies and have a lot of similarities, but a number of distinctions allow EIZO to position and price them completely differently. The EIZO CG2730 and the EIZO CS2730 displays are based on 27” 10-bit 2560×1440 IPS panels with a 60 Hz refresh rate. Based on the specifications, the monitors sport a 350 nits typical brightness, 1500:1 or 1000:1 static contrast, 13 or 10 ms ms response time, and 178° viewing angles. As for I/O capabilities, both devices are equipped with a triple-port USB 3.0 hub as well as DVI-D, DisplayPort 1.2 and HDMI 1.4 inputs. In addition, both monitors come bundled with the company’s proprietary ColorNavigator 6 software, which can set the right brightness, gamma and other settings for photography, printing and web design with the help of calibration devices. Apart from differences in static contrast and response time, the new monitors from EIZO have a number of other important differences. In particular, the higher-end professional EIZO Color Edge CG2730 can cover 99% of the Adobe RGB and 98% of the DCI-P3 color spaces. DCI-P3 is generally important for video editors and animation designers, who do post-production work, because the standard is used for digital movie projection in the U.S. and is expected to be adopted by television and home cinema industries in the future. In addition, the CG2730 is covered with a special retardation film, which ensures depth of dark tones when viewed from an angle. Moreover, to simplify calibration without using any third-party calibration devices, the monitor features a special sensor. Finally, the professional-grade display comes bundled with a shading hood that prevents glare. By contrast, the EIZO ColorEdge CS2730 is aimed at entertainment enthusiasts and prosumers. It only covers 99% of Adobe RGB color space and does not support the aforementioned pro-level features of the CG2730 (yet, it has better response time and that is important for gamers). Realistically speaking, the difference between two displays should not be too dramatic for a non-professional eye in typical applications because both are based on 10-bit IPS panels with 16-bit look-up-table and have similar brightness. Meanwhile, when it comes to contrast and the quality of dark colors, the CG2730 is expected to be significantly better than its consumer-oriented brother. EIZO did not announce MSRPs for its new displays, but said they would be available in November. Just like other ColorEdge monitors the new CG2730 and CS2730 come with a five-year warranty, which is longer than warranties offered by some other display manufacturers. As someone who regularly uses a 144 Hz monitor, the difference between 60 and 120 Hz is noticeable, and does make the game look a fair bit smoother and more fluid, which I personally like a lot. It's really a difference that you only notice after having a comparison, and I found it worthwhile. That said, the colors are atrocious on my example. It doesn't matter much to me, because I have a second display accurate enough for my needs. If I wasn't playing competitive first person shooters and could feasibly do so, I would probably prefer to play games on my more accurate display as well. Freesync adds a ~$25 to $50 premium, depending on the brand.